Even people who know "nothing" about Jack the Ripper, seem to know a good bit of the details of the crime. There are, of course, exceptions. Some people may believe they know more about the Ripper than they actually do. One such example happened a few years back when I was getting off the tube train at Baker Street. For those who have never been, Baker Street station has large tile murals of Sherlock Holmes in silhouette along with information about Arthur Conan Doyle's most famous creation. I was walking behind a young girl and her father, when she asked him, "Who is Sherlock Holmes?" "He was the policeman who caught Jack the Ripper." was his reply; a sentence that is so riddled with errors, that it is almost impossible to know quite how to begin correcting it. However, most people will be able to tell you some facts. 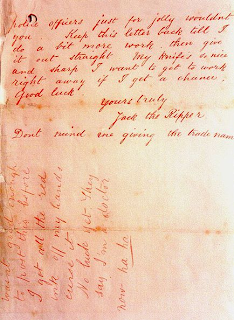 Jack the Ripper killed prostitutes in Victorian London, he was never caught and he wrote letters to the police, taunting them and giving them clues. These letters have proven to be one of the most compelling aspects of the mystery. There were over 200 hundred sent during the autumn of terror and the following years and almost all of them have been discredited as fanciful hoaxes from duplicitous members of the public, or even newspaper journalists eager to print the next installment of this baffling saga. A handful however, cannot be dismissed outright and a couple made it into 1888, mostly because they had proven to be the most interesting historically. 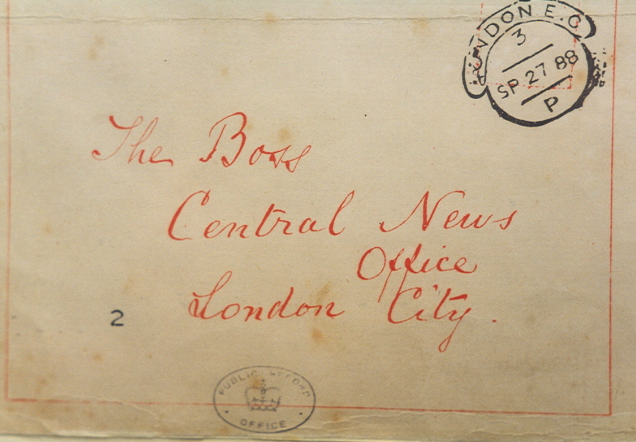 The first such letter was sent to the Central News Agency of London on 27th of September, 1888. The two page letter was written with such a precise hand, some believe that it may have been copied down from another source. The opening line "Dear Boss," would give the piece of evidence its title. 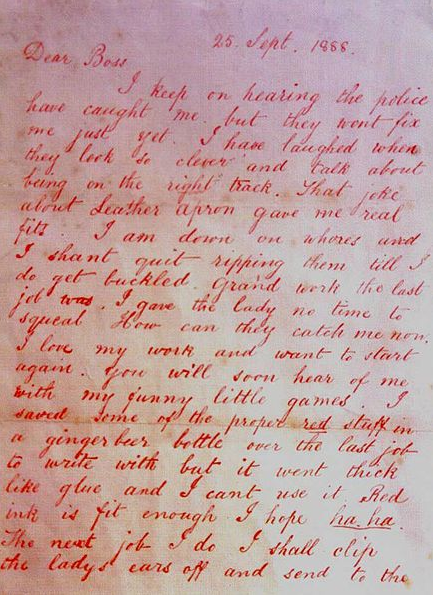 The letter itself was thin on details and very few historians believe that it actually came from the pen of the Whitechapel murderer. However, with this letter, the country had a name to give this most elusive killer. 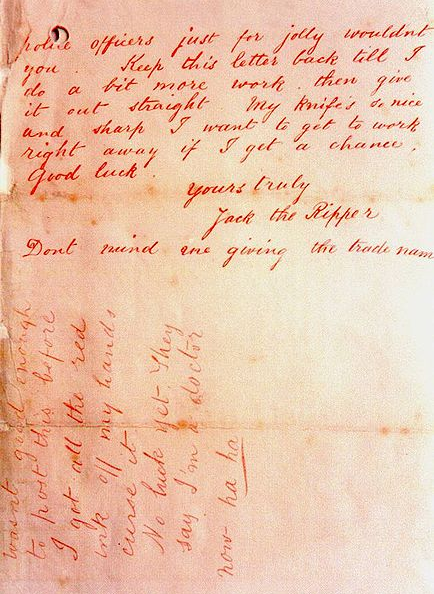 I wanted to include this letter simply for that reason, and also because in doing so, I could finally begin referring to the killer as "Jack the Ripper" in the narrative. The second letter included in my novel was to become known as the "From Hell" letter and in many ways is a much more startling piece of evidence. In reality, as in the book, the letter was received at the house of George Lusk, head of the Whitechapel Vigilance Committee. Unlike my book, Lusk was slow in believing it to be genuine and actually had to be talked into handing it to the police. 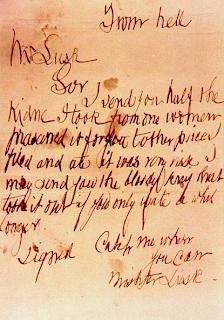 The most striking aspect of the letter is the garbled, misspelled scrawl of text - an inconsistent sort of illiteracy in which the writer is incapable of correctly spelling "nice" but is aware that "knife" begins with a silent "k."
It arrived just over a fortnight after the "Dear Boss" letter and was somewhat unique in regards to not using the term "Jack the Ripper" - which all of the hoax letters sent in that duration were wont to do. 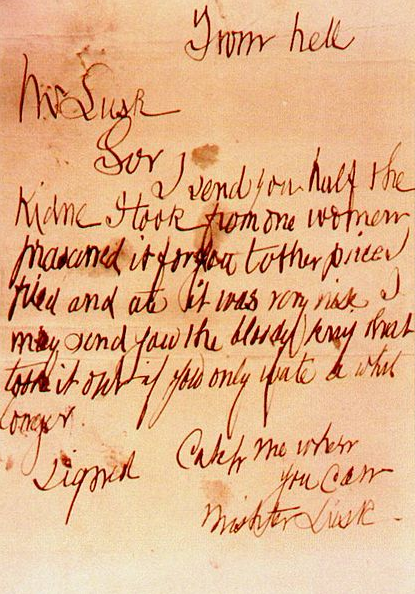 Most chilling of all, the note was sent with the remains of a human kidney. What may be the most infuriating aspect of the case is that the kidney itself, though preserved in formaldehyde at the time, has been lost from the police records. 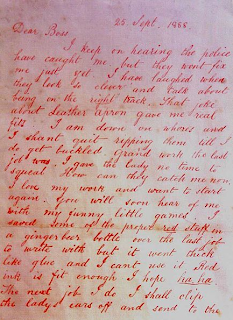 Were it still in the possession of the police, it could have been possible to test the remains for DNA and then could be matched against the living relatives of Catherine Eddowes, thus proving if the letter was indeed genuine. 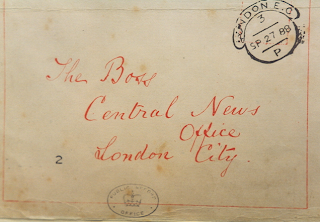 There was another letter sent a couple weeks later to Thomas Horrocks Openshaw, a surgeon who had worked on the case for some time. The letter has some superficial similarities to the "From Hell" letter, but I have yet to be convinced that they are from the same person, and not simply someone writing intentionally poorly with their non-dominant hand. Whatever the truth, I did not think for a moment that I could write a Jack the Ripper novel and not include one of those pieces of information everybody (save for perhaps, that gentleman at Baker Street Station) knows to be part of the case. I suspect that in truth the "From Hell" letter may have been a more elaborate than usual hoax from a medical student at the time, but we can never know for sure. In my book, we are never really certain and as with so many aspects of this crime, the uncertainty is what keeps the mystery alive. Love the introduction, the novel is awesome and hope you share more like this.